But that doesn't stop me from working in my backyard garden(s)! I'd like to say that I grew each and every one of these flowers from scratch, but that is just not true. The delphinium, coreopsis, pincushion flower and dianthus are all from 1# potted plants from Lowe's. They weren't even in the ground yet when I cut them for this Mother's Day bouquet. The roses are all mine, though! I planted three last year on the side of my house and they are growing like gangbusters. Expect more shots as the summer continues. 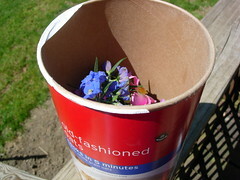 and my new secret for transporting flowers to/fro my mother's house? An oatmeal container!!! Vases never seem to stand upright in my cupholder or on the floor, so I tucked it inside an oatmeal container (emptied, of course!). It sits on the floor without tipping over. Brilliant! Evil EVIL genius. I will totally do this. No more wet floor mats and crushed sweet peas.